This book is very similar to the “Chicken Soup for the Soul” series. The difference is that the stories are all written by women for women. I am not saying a man could not or would not appreciate the stories, however, they focus around women’s issues. I find the stories are helpful in that they provide insights into women’s lives. The book carries a wide range of stories, some of them quite heartfelt. Other stories are just average. I would recommend reading this book if you are looking for some inspiring or uplifting stories. It would be a nice present for a good friend. 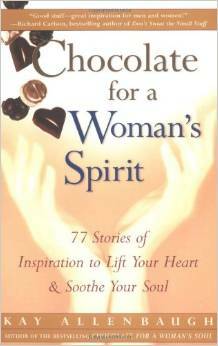 This book is part of a series of contributed stories and so there other “chocolate” books in the series. 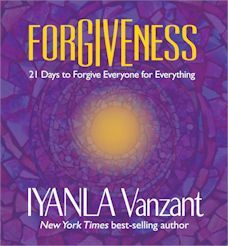 If you are going to read “Forgiveness” by Iyanla Vanzant, be prepared to do some work. Not only does Iyanla give heart-warming personal stories to make the connection between what has happened in her life to requiring forgiveness, you will be writing responses to questions and learning to tap your problems away with ProEFT. It is funny because although Iyanla gives space in the book to write, I did not think to actually write in it until half way through. Instead, I rewrote every word of the question section which took a lot of patience on my part. Next time, I would have used the space required. With the ProEFT, I found it necessary to get more information and so I went to the website run my Lindsay Kenney and looked up more information. I also took advantage of viewing youtube videos that were on her website. I was getting confused between reversal statements and setup statements. I seemed to have figured it out and used it with the karate chop meridian points. As for the tapping, there are 14 meridian points that are affected. It was interesting trying to go from an intensity level of 10 down to a 0. It took patience and effort. This book also has a CD in it. I enjoyed the Stillness Meditation and the introductions to the new day. I personally find Iyanla’s voice soothing so I enjoyed listening to her. There are other stories in some of the daily work. There is a little note above each section to indicate who wrote each section, however, I did not notice it until later and so I was confused about how the story related to Iyanla as the stories were different story lines. Just remember to read all the print. Overall, this book is a good workbook. My only criticism is that it should have been formatted in a larger workbook format such as “Living in the Light Workbook” by Shakti Gawain. I found it hard to keep the book open to the pages I needed while copying down information. I had to memorize parts to get it transferred properly. Plus, I found it hard to keep the book open on sections that provided very specific tapping instructions on the 14 meridian points which were most helpful and gave me a better direction of what I was supposed to be tapping to. Finally, I would like to say that the tapping process is something that I was familiar with, however, never really truly worked on it. It seemed to work and I will be keeping up this type of work now that I understand it better. If you are into having more peace and love in your life, I suggest this book for you. If you have enjoyed seeing Iyanla on TV in “Iyanla, Fix My Life” or on Oprah then this book is right in line with her other work. I found I enjoyed “Every Day I Pray” and also “Until Today.” Her work is continuous of the themes she works with in terms of compassion and forgiveness, to name two areas. It is time to move forwards with your life by forgiving everyone for everything. 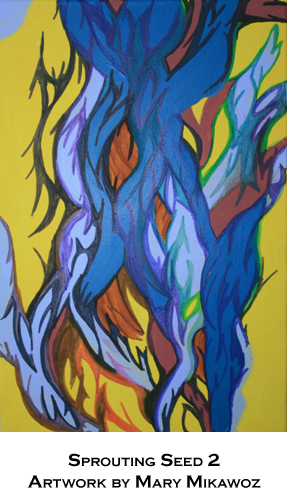 This abstract painting is a continuation of the Sprouting Seed and like the first soul emerging; this is the second soul emerging from the first one. If you look at the first picture and the second picture, you will see that they connect and the first painting “feeds” into the second one and like the “bone” from Adam’s rib, this represents this connection with the creation of Eve from the Bible. She is whole and complete because she has her own seed that she has come from but has been aided with the help of Adam.